We generally supply small, two year old, young plants, in 9cm pots (unless otherwise stated) that will grow away strongly through the year. The following plants should ideally be planted between March and September. 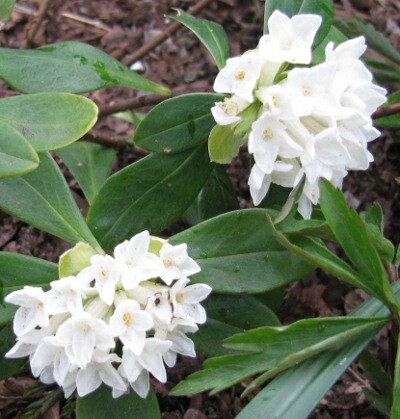 The alpine Daphne must be given a well drained soil in good light with good ventillation but probably best not over exposed to cold winter winds. However we have some fine examples at the nursery that would even contradict that statement. The "woodland" Daphne are ultimately quite large shrubs and generally require space to grow, in a well drained though slightly moisture retentive neutral to acid soil, light shade or reduced light levels (say north facing). 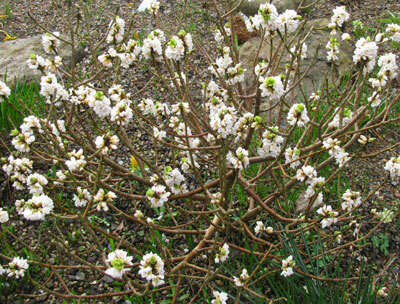 A choice, compact form of Daphne blagyana with prostrate trailing thick stems bearing creamy-white fragrant flowers from January to April. Does not like to dry out, suggest an annual mulch of leaf mould, in sunlight or dappled shade. Slightly tender upright form with small blue-green leaves and typically scented white flowers in June, limited availability. 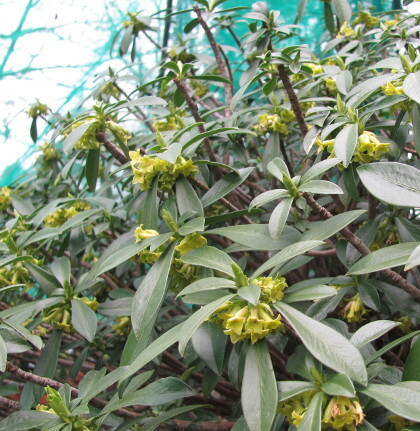 Dense, evergreen shrub up to 35cm in ten years with clusters of yellowish-green flowers in February to March. Very hardy, dappled shade or sun. Deciduous upright shrub that has fragrant white flowers on bare stems in spring, leaves after flowering, then scarlet berries. Very hardy. Evergreen, large bushy shrub with glossy dark green leaves narrowly edged with yellow, clusters of very fragrant deep purplish-pink and white flowers from February to April. 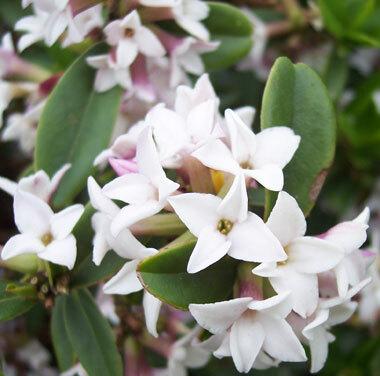 Many star-shaped white flowers, above a grey-green foliage, evergreen shrub to 60cm eventually, few only. A very hardy, erect evergreen shrub from China with shiny dark green foliage and terminal clusters of fragrant white flowers tinted pink with purplish-rose reverse during March to May, followed by red berries in autumn. A profusion of fragrant white, pink-flushed, purple backed flowers from March to mid June, and then often again in autumn. Later large, deep red berries in autumn attract many birds to feed. 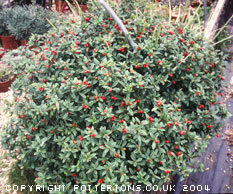 An excellent erect, evergreen shrub with dark glossy green leaves. Limited availability. Outstanding golden-yellow edged green leaf, excellent striking evergreen form which produces clusters of fragrant, pale pink flowers in the Spring. Large pots. Compact form with white flowers, very few only, small plants. Dark pink-purple flower buds opening up to large pink flowers often fading to near white. Intensely fragrant large pink flowers over dark green foliage. Best if planted in full sun, hardy. Limited availability. Narrow dark green leaves, dark pink fragrant flowers in late June or July, this plant forms a very tight compact mound. Limited availability. 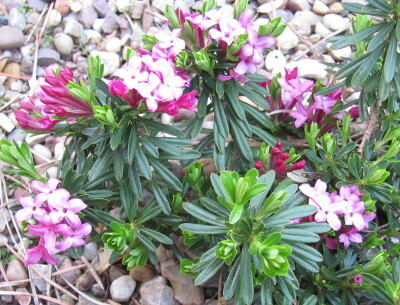 Narrow dark green leaves, dark pink fragrant flowers, forms a very tight compact mound. 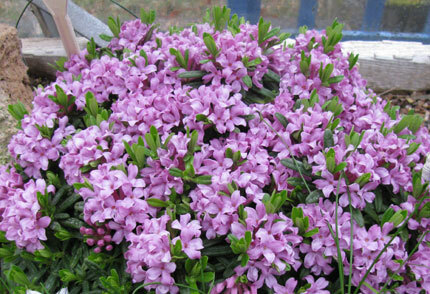 Hybrid between D. arbuscula x D. collina, deep glossy green leaves and highly scented purple-pink flowers. Hardy. 20cm x 15cm in 10 years. A superb, beautiful Daphne, compact, dome-shaped habit, with large pink flowers, narrow strap-shaped leaves, best planted in sun. 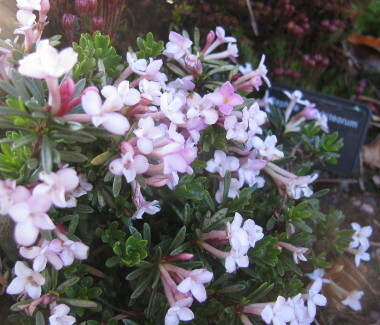 The natural hybrid between D. petraea and D. striata, pale pink flowers, dark pink in bud. (Daphne petraea grandiflora x D. jasminea) very compact growth, short stems covered with crowded leaves and clear pink scented flowers. Limited availability.